It’s because you have subscribed to one of Seven Figure Publishing’s publication Mike Burnick’s Amplified Income. Mike Burnick’s Amplified Income cuts through the noise to bring you lucrative opportunities no matter what the market is doing. It worked during the dot com bubble. It worked during the great recession. Now the world’s first ever audio-based investment indicator system can give you access to incredible gains that nobody else sees coming. Email us at feedback@SevenFigurePublishing.com and one of our Customer Service Representatives will get back to you as soon as possible. It’s because you have subscribed to one of Seven Figure Publishing’s financial newsletters by the name of Seven Figure Prime. If you’re having an issue with your subscription or have a question about the billing for Insider Network, please contact our customer service department. We’d be happy to help you out! You can contact customer service by phone or email using the contact information below. Call our Customer Service team toll-free at 1-844-370-6637. International customers can contact us at 410-454-0499. Seven Figure Publishing helps readers protect and grow their wealth. With a diverse array of online newsletters, print publications, books, documentary films, and events, we’ve helped provide unique and effective ways to navigate different parts of our market. Our research is 100% unbiased and independent – that means we never accept money in return for coverage. 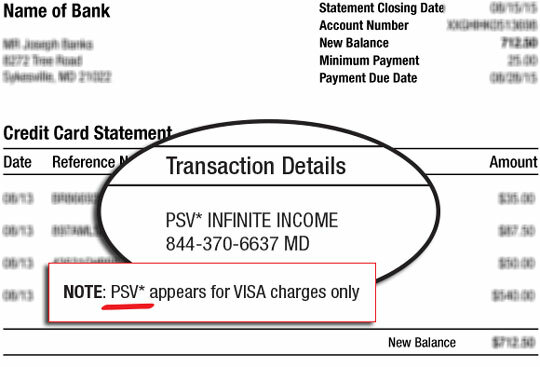 What is PSV* Infinite Income? It’s because you have subscribed to one of Seven Figure Publishing’s financial newsletters by the name of Infinite Income. If you’re having an issue with your subscription or have a question about the billing for Infinite Income, please contact our customer service department. We’d be happy to help you out! You can contact customer service by phone or email using the contact information below. It’s because you have subscribed to one of Seven Figure Publishing’s financial newsletters by the name of Seven Figure Signals. It’s because you have subscribed to one of Seven Figure Publishing’s financial newsletters by the name of Kinetic Profits. Kinetic Profits is a technical trading service unlike any other. Editor Jonas Elmerraji brings you a systematic way of catching a stock’s strong trading tail wind, year after year, month after month — with no emotion and no bias. If you’re having an issue with your subscription or have a question about the billing for Kinetic Profits, please contact our customer service department. We’d be happy to help you out! You can contact customer service by phone or email using the contact information below. Call our Customer Service team toll-free at 1-844-370-6637. What is PSV*The Seven Figure? It’s because you have subscribed to one of Seven Figure Publishing’s financial newsletters by the name of The Seven Figure Formula. If you’re having an issue with your subscription or have a question about the billing for The Seven Figure Formula, please contact our customer service department. We’d be happy to help you out! You can contact customer service by phone or email using the contact information below. It’s because you have subscribed to one of Agora Financials’ publications, Hot Money Trader. Hot Money Trader shows you how to use “Hot Money” signals to profit from unusual insider activity. It’s like finding a needle in a haystack, but with Joshua’s “Hot Money” system, it’s never been easier. If you’re having an issue with your subscription or have a question about the billing for Hot Money Trader please contact our customer service department. We’d be happy to help you out! You can contact customer service by phone or email using the contact information below. It’s because you have subscribed to one of Seven Figure Publishing’s financial newsletters by the name of Penny Pot Profits. Penny Pot Profits has a simple goal: To weed through the emerging marijuana industry to find the best, most potentially lucrative penny pot plays on the market. The revenue floodgates are open for those who stake a claim in this new market… and that could be you. Ray Blanco will be your guide through the new world of marijuana investments. Using our exclusive Penny Pot Index — a proprietary method of trading not used anywhere else — Ray and his team of analysts are able to track trends in the marijuana market… determining the exact moment to trade penny stocks on the market. It’s a foolproof way to make money in the blossoming marijuana industry… and you have a leg up on the profits. The PSV* before the name of the newsletter stands for “publishing services,” indicating that the charge is for a newsletter service. Other publishing houses use this same acronym. Following that is the name of the publication. In general, the PSV designation appears only on Visa card statements. If you’re having an issue with your subscription or have a question about the billing for Penny Pot Profits, please contact our customer service department. We’d be happy to help you out! You can contact customer service by phone or email using the contact information below. What is PSV*The Rude Awakening Pro? It’s because you have subscribed to one of Seven Figure Publishing’ financial newsletters by the name of Rude Awakening Pro. Rude Awakening Pro is a daily investment publication. In each daily email from Editor Greg Guenthner, readers receive a new short-term or longer-term trade idea when the market opens. Greg will show readers, in-detail, why they should buy the trade and each day he’ll follow up on the recommended trades to keep readers up-to-date! Over the past decade, Greg Guenthner has helped build Agora Financial’s small-cap and technical research teams. His analysis has appeared in Forbes, Yahoo Finance, Bankrate, and countless other publications. Greg is a member of the Market Technicians Association and holds the Chartered Market Technician (CMT) designation. If you’re having an issue with your subscription or have a question about the billing for Rude Awakening Pro, please contact our customer service department. We’d be happy to help you out! You can contact customer service by phone or email using the contact information below. What is PSV* Ray Blanco’s FDA? It’s because you have subscribed to one of Seven Figure Publishing’ financial newsletters by the name of Ray Blanco’s FDA Trader. Ray Blanco’s FDA Trader is an investment newsletter written by our biotech guru, Ray Blanco. Ray believes that biotech is the most valuable thing in the world because no one ever gets tired of life and being healthy – so it’s a great place to make money. Editor Ray Blanco earned his bachelor’s degree in information technology from Hodges University before working as a network technician and systems analyst. Combining his passion for technology with his financial and stock market expertise, he joined Agora Financial in 2009. Ray spends his days scouring the markets for “the next big thing.” Trimming his list to only the most groundbreaking, industry-shattering technologies, he helps the Average Joe stay ahead of the curve… and shows them how they can substantially grow their wealth. If you’re having an issue with your subscription or have a question about the billing for Ray Blanco’s FDA Trader, please contact our customer service department. We’d be happy to help you out! You can contact customer service by phone or email using the contact information below.